For all the customers who have asked me about stocking Julia Donaldson's picture books, I now have some in store. 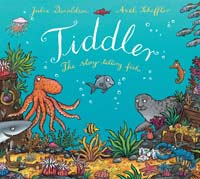 Julia Donaldson is probably known for her books The Gruffalo and The Gruffalo's Child which were illustrated by Axel Scheffler, and as well as these, the store now has two other books by the same team. Zog is the keenest dragon in school, but will he ever win a golden star. 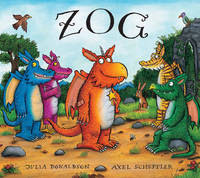 At Zog’s school he must learn to fly, roar, breathe fire, capture princesses and fight knights. But whenever he gets a bump or a scrape, a mysterious little girl is always there to nurse him better. Perhaps Zog has a different destiny after all . . . But on the way to school I was captured by a squid. I wriggled and I struggled till a turtle came and rescued me." "Oh, no, he didn't" "OH, YES, HE DID." Do you believe Tiddler's story? Click on the cover to read our children's reading guide. Christmas is Coming! What do I get the children?